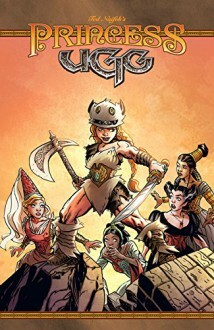 A new series from Courtney Crumrin creator Ted Naifeh! Princess Ülga isn’t your standard princess, but her royal lineage goes back for generations. At her mother’s bequest, Ülga travels to the city-state of Atraesca, where the prestigious Princess Academy lies, so that she can learn about things like diplomacy–hopefully for the benefit of her rough and tumble people. But Ülga will learn that she’s more behind in her studies than she realized–and that when you’re a princess, you’re bound to have a few enemies. This book was enjoyable, but I couldn't really get with the whole dialect of Princess Ugg. Her foreign language confused me from the beginning. The artwork was fabulous and the premise was awesome, I just kept getting annoyed with Princess Ugg. Overall it was an okay read for me.